Dashboard is OS X 10.4’s new “always ready” utility application. When you hit F12, Dashboard springs forward, dimming the background, ready to provide you a wealth of information on everything from airline flights to currency conversions to stock prices—and much, much more if you install some of the hundreds of third-party Widgets that are already available. But all of this power comes at something of a price—mainly increased RAM consumption from open widgets, even if Dashboard itself is closed. Look at the screenshot below and pay attention to the Real Memory column. That figure represents how much actual RAM each Widget is using—even though Dashboard itself wasn’t opened when this image was captured. If you have a Mac with limited RAM, you may wish to disable Dashboard to deny yourself the temptation of these oh-so-handy Widgets. (Even if you don’t disable Dashboard, you should try not to leave lots of Widgets open if you’re working on a RAM-constrained Mac). There may be other reasons you’d rather not have Dashboard available. For instance, if you run a lab of Macs in a school, you may not want the students wasting all their work time on the Asteroids video game widget or watching the (I am not making this up) Goblet of Fire movie release date countdown Widget. 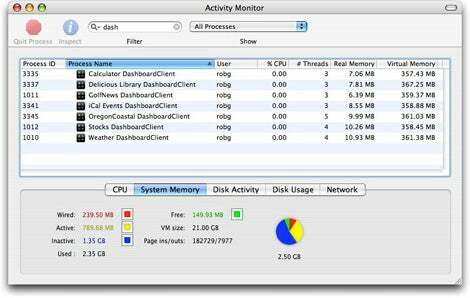 If you’d like to disable Dashboard, for either RAM usage or other reasons, here’s how to do it. It requires a trip to the Terminal, in /Applications/Utilities, but it’s not too hard to do. command to make the changes take effect. Once you do, though, you’ll find that Dashboard is back as usual—and any widgets you had opened on the Dashboard will still be open.